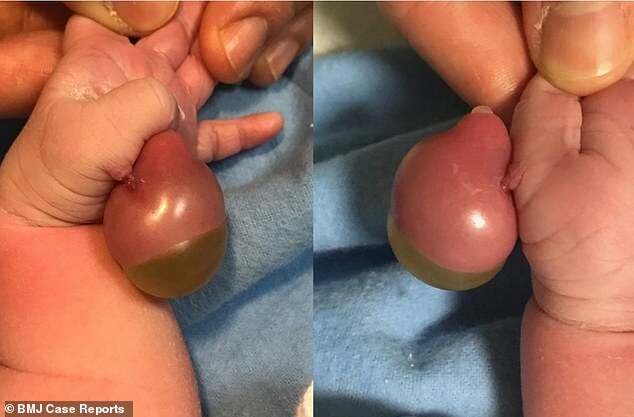 Doctors have released a series of fascinating photos of a strange balloon-like growth on a baby’s hand. 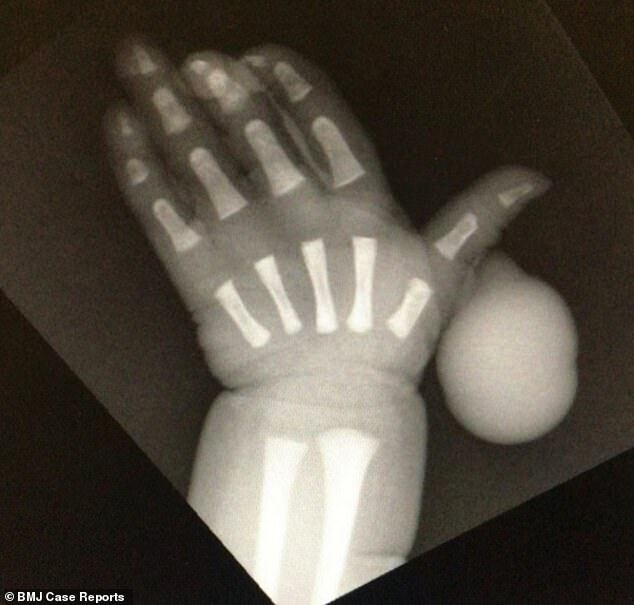 The child was born with a dangling lump on his hand that could have developed into a second thumb. However, it turned out to be, in essence, a lump of flesh with a giant blister on it. Doctors in Singapore claim the bizarre growth, which measured 0.9 inches (2.5cm) long, is the first of its kind ever recorded. Not containing any bone, muscle or nerves, the lump was medically identified as a stalk with a large pus-filled blister on the end. In their study in the journal BMJ Case Reports, the doctors said they couldn’t pinpoint the cause of the growth but said something like it ‘has never been reported’. The baby is believed to have been born at KK Women’s and Children’s Hospital in Singapore, where doctors immediately acted to fix the growth on his thumb. An X-ray was taken just four hours after the boy was born weighing 7.5lbs (3.5kg) after 37 weeks. Medics used scissors to slice off the growth under local anaesthetic. The growth was balloon-shaped. Its tightly-stretched skin gave it a hard and shiny appearance. A huge blister on the end of the soft tissue measured 1.6cm (0.6ins) by 1.5cm (0.6ins) – it is believed to have been painless. The condition behind the growth is called polydactyly. Normally, babies gain an extra piece of skin. In rarer cases, they can develop a fully-formed finger or toe. Polydactyly, caused by genetic deformities before a baby is born, is the most common limb defect in babies. It occurs in around one in 500 births. Boys are twice as likely to be affected than girls and the most common form of treatment is surgery to remove the extra digit. Polydactyly can be caused by a genetic defect or inherited from a family member – doctors did not discover the cause in this patient. The growths are usually less well formed than other digits and in this case the boy’s specimen was not controllable. Doctors decided not to remove the lump by cutting off its circulation because it could cause nerve damage in the healthy thumb. Members of an extraordinary family in India have 600 digits between them – with each of the 25 members boasting 12 fingers and 12 toes. Krishna Choudhary, who lives in a small village in Gaya, in Bihar, northern India, has six fingers on each hand and six toes on each foot – just like his father and siblings. But the unusual condition has meant the 50-year-old has found it difficult to arrange his daughter’s marriages – because prospective husbands dislike the condition. The extra digitis are caused by a condition called polydactyly, which can be passed on genetically and can make extra fingers and toes grow on babies before they’re born.